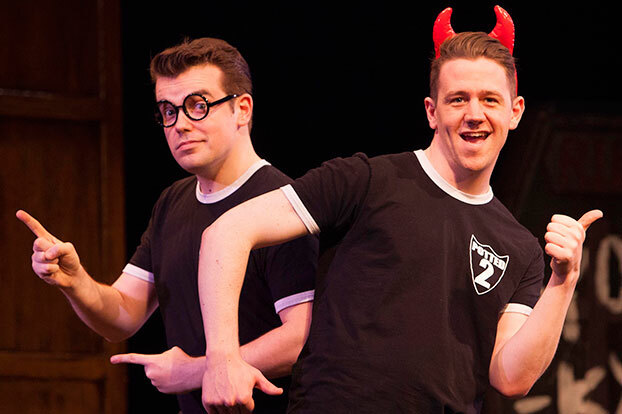 We catch up with one half of the Potted Potter cast to ask some terribly serious questions. Seven books in 70 minutes... how do you choose what stays in and what gets cut? Well, fortunately we didn't have to make those difficult decisions. Two guys called Dan and Jeff wrote the show about 7 years ago, so they had that hard task. They always say how there are so many other characters they wish they had time to include. Secretly, Ben and I are very pleased the show only lasts 70 minutes, we're about ready to collapse at the end of it in a big sweaty heap. Nice. Who’s your favourite Harry Potter character to play? That's an easy one. I play Harry and Ben gets to play every other character, so Harry is by far my favourite. I do think I could play a more convincing Hermione though, Ben's version of Hermione is downright weird. Beautiful, but weird. The magical, mystical internet once decided that I'm a Ravenclaw. I think I agree. I'd like to stay out of trouble, get good grades and preferably stay alive, so I'll go with Ravenclaw. What’s your best Potter-based pickup line? Hmm. I don't think I'm cool enough for pickup lines. I'm a bit of an old romantic, a bit of a stuttery awkward Hugh Grant figure with floppy hair, but I do think this one is quite nice... "I don't need The Mirror of Erised to know you're everything my heart desires." I promise I've never used it though. Yet. Should quidditch be in the Olympics? I don't see why not! People say that Quidditch would look silly, but have you seen some of the ridiculous looking sports in the Olympics? What's that one where people just sweep an ice rink very quickly? Ah, curling. Madness. What flavour would you add to Bertie Bott’s Every Flavour Beans? Well, my favourite meal is a British Sunday Roast. So I'd like a single bean that had all that going on. I'm talking turkey, roast potatoes, brussell sprouts, cabbage, carrots - the whole lot. It would save a lot of Sunday morning peeling. Get on it, Bertie.